Are you searching for a gorgeous new baby gift set to welcome the latest little arrival? You need not look any further now you've found this gem! Here at Smart Gift Solutions, we’re proud to introduce our brand new stunning selection of Welcome Baby hampers to our baby range, including this delightful Paddington Bear gift set. Featuring one of the world's best loved literary characters, our exclusively designed gift is a contemporary twist on a traditional teddy favourite and will provide the new baby with a companion for life. Beautifully gift wrapped with silk printed ribbon and our specially designed gift sleeve, our welcome gift set is brilliant value for money and a must-have for the new addition! You’ll bring a warm smile to the recipient with this splendid treat. Personalised 'Welcome Baby' Candle - large pillar candle. 'My First Paddington for Baby Plush' - from birth, 24cm. Paddington for Baby Booties Set - 0-6months. 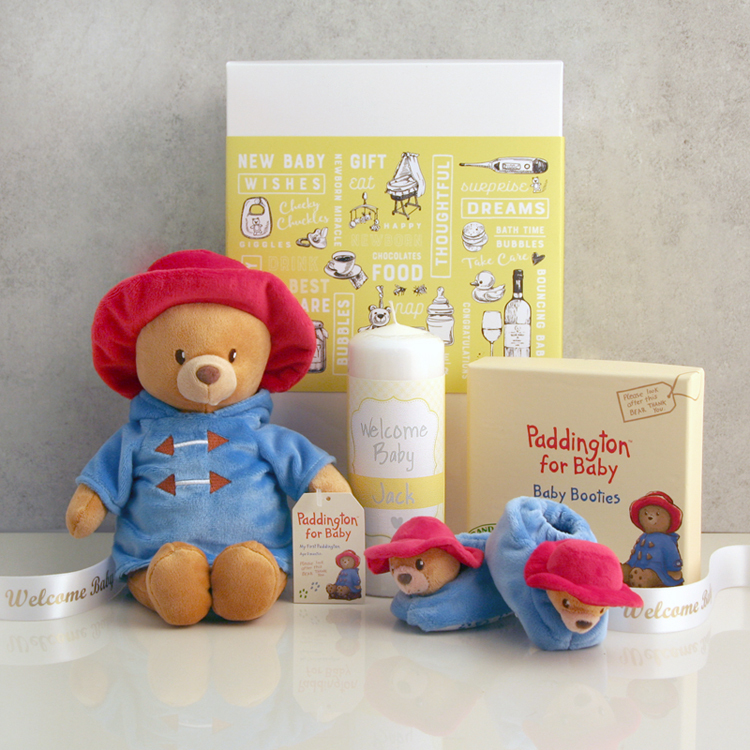 Our exclusively designed Welcome Baby gift set features the stunning character of Paddington Bear. Recreated with a contemporary take on the treasured British story, the latest Paddington Bear toy is a super cute addition to the collection whilst maintaining all of the bear's best features! You’ll still find his blue duffle coat embellished with hand-stitched buttons, along with his famous red rain hat! Although with a new twist, he is still very much resemblant of the old favourite design. Made from premium plush, the toy’s design ensures it is as soft and cuddly as can possibly be by removing all rough or hard pieces of material. It is perfect for newborns and is perfectly safe too. You’ll also find a gorgeous pair of matching Paddington for Baby Booties Set, another wonderful addition to the nursery collection. Gift packaged in a traditional cream keepsake box, designed with illustrations to resemble Paddington's trusted suitcase, the soft booties feature a character head with a jingle rattle in each toe. With a stretchy lining, the shoes are perfect for 0 to 6 months and can be treasured for many years in their matching gift box too. The box features the text, in a luggage tag, 'Please look after this bear, thank you'. What’s more, our gift is right on trend! With the 2017 release of StudioCanal's second live-animation Paddington film, the marmalade-loving polite bear is back on our movie and television screens and is sparking a newfound appreciation of the story! You may also remember him in Marks and Spencer's wonderful Christmas advert too. At over 70 years old - with Michael Bond creating the traditional story in the late 1950s - it is fantastic to see Paddington Bear continues to be adored by children in our modern 21st-century culture! He is an icon we can love and treasure, whilst teaching us all the importance of manners! We have also included our Personalised ‘Welcome Baby’ candle! In a gender-neutral yellow, our large pillar candle features an exclusively designed sleeve with the wording ‘Welcome Baby’ and will feature your chosen baby name with an illustrative heart motif underneath. Enter your chosen name up to 12 CHARACTERS in the box provided. Fixed text reads ‘Welcome Baby’ and cannot be changed. All of the gorgeous products are neatly packaged into our uniquely designed contemporary gift box, with a bright and eye-catching illustrative sleeve. Featuring words like ‘New Baby’, ‘Thoughtful’ and ‘Dreams’, there are lots of lovely baby-themed drawings for a lovely added touch. Finally, the gift set is tied with a beautiful bow in our customised silk ribbon, featuring the wording ‘Welcome Baby’ in a stylish cursive font. Please make use of our gift add-ons, which you can include at no extra touch! Our free Photo-Card allows you to add a picture of your choice, alongside a heartfelt message to your recipients, which will be printed on one of our exclusively designed, high-quality 'Just to Say' gift cards. You can also add one of our free gift-tags to be attached to the Welcome Baby ribbon to congratulate the new family on the birth of their baby! It's a brilliant addition to your stunning gift selection that will show you've gone the extra mile.